Lentils seem to go with just about anything and here they play well with a collection of greens and some cumin and coriander to add a gentle spicy note to this soup recipe. Peel and dice a butternut squash, then puree it with carrot. 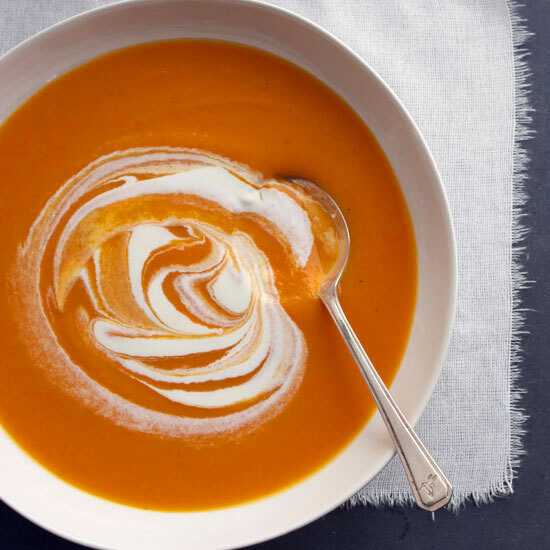 Adding toasted pumpkin seeds (pepitas) creates a crunchy finish for this low-fat soup. Gorgeous red tomatoes are the star in this bisque imitation. Garlic, onion, basil and optional cognac add depth. Pureed black beans + garlic pepper sauce + broth + lime juice = sensational winter soup. Consider adding a low-fat dollop of sour cream or Greek yogurt for a bit of creaminess. The original recipe calls for a bit of sausage—which can be omitted for an even healthier, vegetarian version. Classic split pea soup is given an herb makeover with the addition of rosemary in the ingredient list. Another unexpected (but delightfully delicious) flavor? Soy sauce! Photo courtesy of Better Homes & Gardens.